This article describes how to use Special Links and Merge Tags in messages. When you create new templates in Zunos there are two components which allow you to link to areas of the app, as well as information stored in the admin portal. They are called Special Links and Merge Tags. Special links are action links and users can tap or click on these to take them to different areas of the app. Merge Tags are tags which draw information already stored in Zunos such as First Name, Username or Event Location. To access these Special Links and Merge Tags, click on any text field and then click the toggle toolbar to access more settings in the text tool bar. 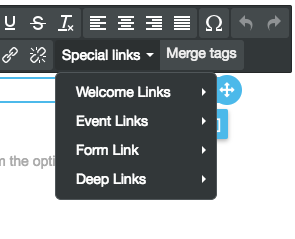 Click on the Special Links button to see options for password, events, and deep links. The Welcome Links option contains two links which should be used in Welcome templates only. The Event Links option contains one link which can be used in an event invite template only. It allows users to open the event registration portal and register for a session in Zunos. Form Link is an option to use for users to click on to get direct access to a form. When choosing Form Link, Direct Form Link will be the next step that appears. Here, Admins can choose the form they want users to access. Form Link is a great option for admins to use for users who do not have mobile app access to Zunos. Deep Links can be used in any template type, but are most suitable in a generic message. These links will link to the corresponding areas of the application. To avoid confusion, always notify users that they need to be on their iOS device to open the link. See the list below of the merge tags and which templates they can be applied in.